Dr. Patrick Smith's research group at the University of Sheffield used MicroFab's Jetlab® printing system to demonstrate ink-jet printing of biological and neuronal cells. The precise printing technique can be used for lab-on-chip technologies and to fabricate neural networks for fundamental neuroscience studies and applications. “Ink-jet printing can be used to produce finer neuronal networks than produced by other techniques since the printed cells produce longer neural processes,” Smith explains. Xiubo Zhao from The Department of Chemical and Biological Engineering at Sheffield University has created microscopic swimming devices using MicroFab's Jetlab® printing systems. Thetiny rockets, which measure 300 by 100 microns, actually create their own thrust, enabling them to swim through bio fluids. How? A form of inkjet 3D printing is used to deposit a solution of dissolved silk mixed with an enzyme called catalase. Layers of dissolved silk mixed with an enzyme called catalase are built up with other methanol layers by the MicroFab's drop-on-demand printer. A chemical reaction between the methanol and the solution forms the rigid rocket shape of the device, trapping the enzyme within a silk lattice. The catalase then reacts with fuel molecules, producing bubbles which propel the rocket forward. Click on the link below to watch the video of the TEDxMIDWEST talk by Dr. Ben Harrison with Wake Forest Institute for Regenerative Medicine on tissue engineering. MicroFab, in ongoing collaboration with Wake Forest Institute of Regenerative Medicine (WFIRM), demonstrated 7-day survival post printing & encapsulation. 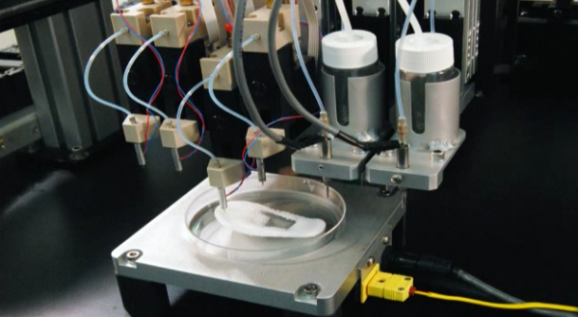 These experiments used a custom ink-jet Bioprinter built by MicroFab and installed at WFIRM.